I'm joining two of our favorite Blogville Susans! 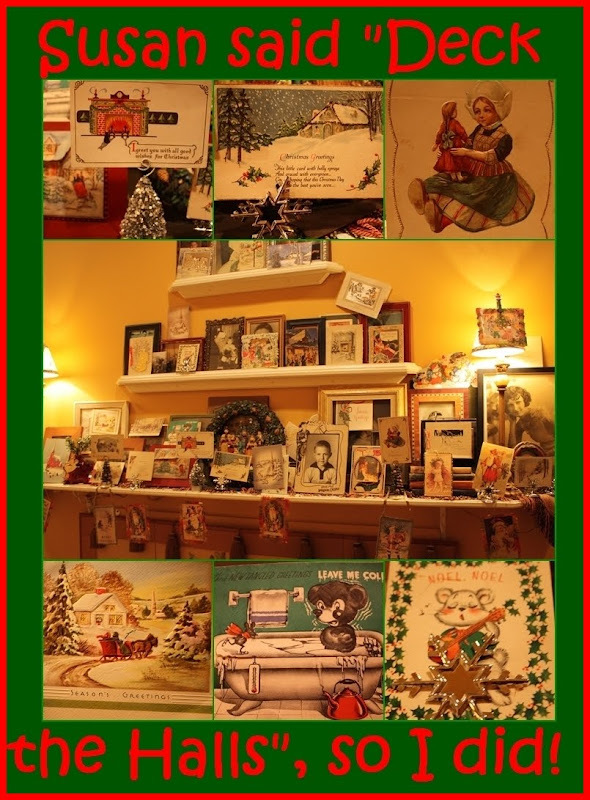 You'll find Deck the Halls links at Thoughts from Over the Rainbow. If I remember to link to it, I'm also joining Tablescape Thursday. Of course, those links are at Between Naps on the Porch. This time of year and decor are the BEST!!! Hi Laurie! Wow you have gone all out! I love it that you call the grandkids room the "Grandchildren's overnight room" I have one of those too! Its all so beautiful and festive! Beautiful tablesetting Laurie! The manger centerpiece is so precious, and I love how you made the pine in the vases look like palm trees too!! I gotta tell you also how much I LOVE the silver sleigh, reindeer, and bottlebrush trees on your bedroom mantel, what treasures they are!! Have a Merry Christmas Laurie!! WOW, amazing. I want to sleep in your grands sleep over room. There is so much love in every thing that you have created that I know you & your family will have a wonderful time together this Christmas. The table, set for Christmas Eve, is stunning. Laurie-you have been a busy little bee! Not a decoration in sight in my master bedroom--unless you count my husband's red hunting longjohns draped over the chair :) I love that nativity on your beautiful table--the faces are so real. Wish I could see the Christmas eve pageant! Merry merry Christmas to you! Merry Christmas, Laurie! and by the looks of all you've done it will be for all who enter your home! You have a beautiful home! I love the nativity scene on your table, it's beautiful! Have a Wonderful Christmas! Merry Christmas ... Ms. Laurie! To you and everyone you love. Merry Christmas, Laurie! Everything looks beautiful! If I don't get a chance to see you before Christmas I wish for you a beautiful and Merry one. I hope that 2010 brings you only the best of good health and happiness. I still say I want to come to your house at Christmas time. It's like Santa's wonderland. Everything looks lovely and so inviting Laurie! I love using a nativity set as a centerpiece! Merry Christmas to you and your family, Laurie! My, my, my!! You certainly know how to deck the halls!!! Everything is fabulous! I love the tablescape. 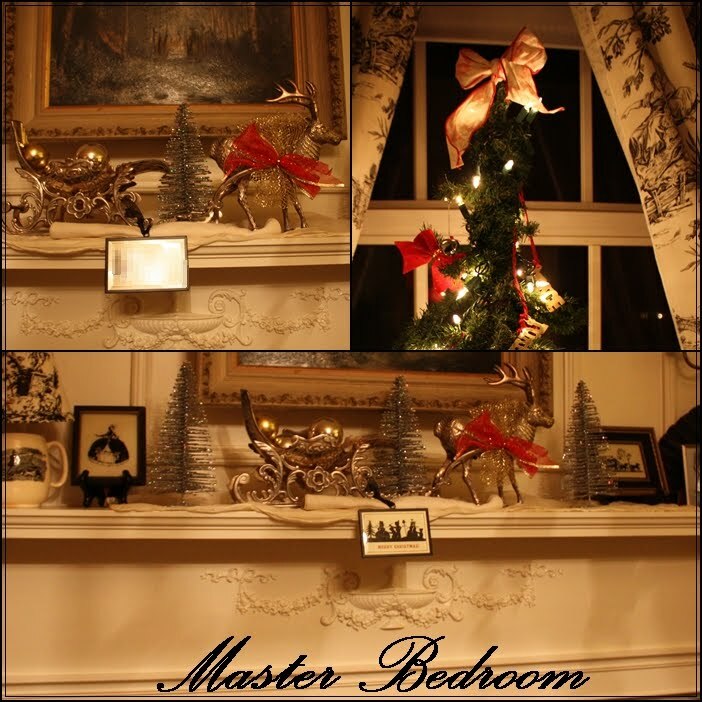 And I love your silver deer & sleigh on your master bedroom mantle. I think I have the exact same one. I'm going to use mine for my Christmas tablescape. Only if I can get it done tonight & take photos to post tomorrow. Then we can compare if they are the same ones or not. I love everything you shared with us. What a stunning table. Your center piece is so beautiful. Thank you for sharing. Laurie, your Christmas table is so beautiful. I love that your Nativity is the center piece. All the rooms look like your definitely ready for Cristmas! I think you are amazing. I can't imagine how much time this all takes each year. Tell me you have some help! Your fa la la is fine.. Hark..I hear the angels sing..
That you have worked very very hard! 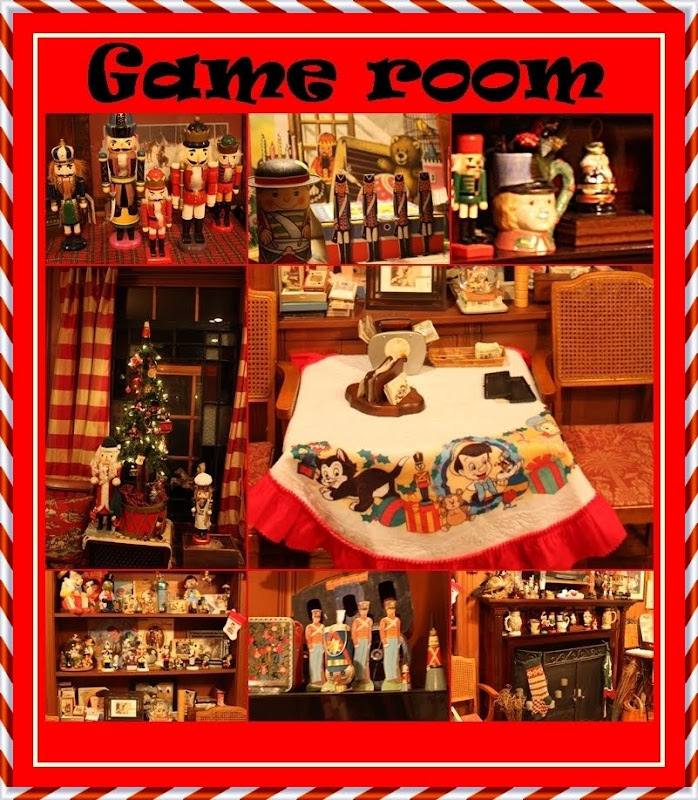 I love your Christmas touches everywhere in your house! And how you honored Christ's birth in your tablescape is breath-taking! Have a most joyous, blessed Christmas my friend!! Wow! I think you have been one busy lady!! Everything looks wonderful..Christmas is everywhere..and your tablescape is just beautiful! Merry Christmas Laurie!! Hugs! Stopping by to wish you and your family warm wishes for a very Merry Christmas and a Joyous New Year. Everything looks wonderful in your home -your Grandchildrens's room is adorable. Hey Sister! Merrrry Christmas!! God Bless you!!! Just dropping by to wish you a Merry Christmas, Laurie! I came by to wish you a Merry Christmas ! I hope your day was wonderful and you were with all your family. You are getting to be quite a "collagist", my new word for you and your talent. Enjoy the rest of your holiday and Happy New Year. Laurie-= A very Merry Christmas albeit tardy to you and your family! Tried to get over sooner but you know being an elf is hard work and little time for yourself these days!! Somebody pick me up off the floor! Laurie, this is just wonderful!! Your table setting is divine...pun intended. :-) Beautifully done in every single room. I'm so happy I got to see it all, through your photos. Thanks for sharing your delightful collections with us. OMGoodness...you DID get all decked out for Christmas. It is all just stunning. Thanks for dropping in to see the two photos...one lives in Texas and the other, in PA., I think...amazing! A belated Merry Christmas Laurie! Thank you for stopping by and visiting my tablescaps. I was so happy to see your note. 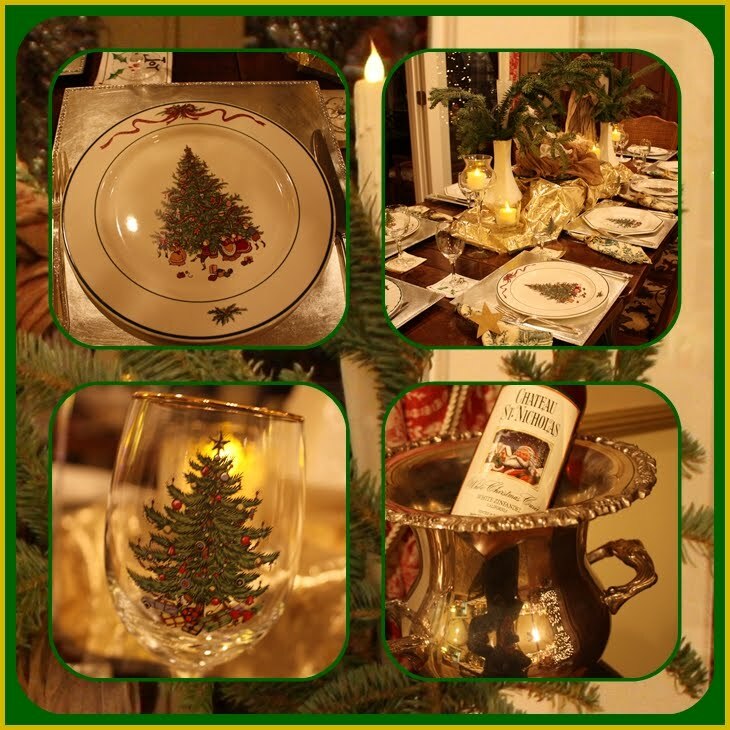 Your table settings and trees truly warms my heat with the spirit of classic Christmas time. The entire home is layered with love and care for family and friends both young and old. Thank you for inviting us into your beautiful home. YES, I did get the kitchen Aid Mixer! If he wouldnt have put that box out I would never have guessed! I'm going to post a picture of it later..
Everything is decorated so nicely in your home, form the beautiful dining room to the grandchildren's room. They must LOVE to come and visit!! I love your Spode dishes, I have always wanted the Christmas Tree pattern but just have no place to store them. They are gorgeous...and so is your table with the Virgin Mary and baby Jesus! I am also loving the St. Nicholas Wine! lol! Have a Happy New Year, sweet lady! Merry Christmas and all the very best to you and your family. i scrolled down and absolutely LA LA LOVE your decorations!! your home is so BEAUTIFUL too! thank you for sharing the smiles!! wishing you a safe and WONDERFUL holiday season, Laurie!! i can hardly wait to get my computer fixed so i can visit you more. You table looks beautiful fo r Christmas. I hope you have a great time. Wishing you a healthy and prosperous new year. Laurie~ it's nice to know I'm not alone in the Santa collection obsession. He's just so darn cute and I like a man who looks like he enjoys good cookin',lol. We also share a very similar if not exact Christmas dinner plates. I pulled mine out for our Christmas Eve dinner too, but switched to the white and silver china to match the theme of the decor I had going. I really enjoyed the look see. You really pull out all the stops. What a wonderfully festive surrounding for your family and friends. Wow you have gone all out! 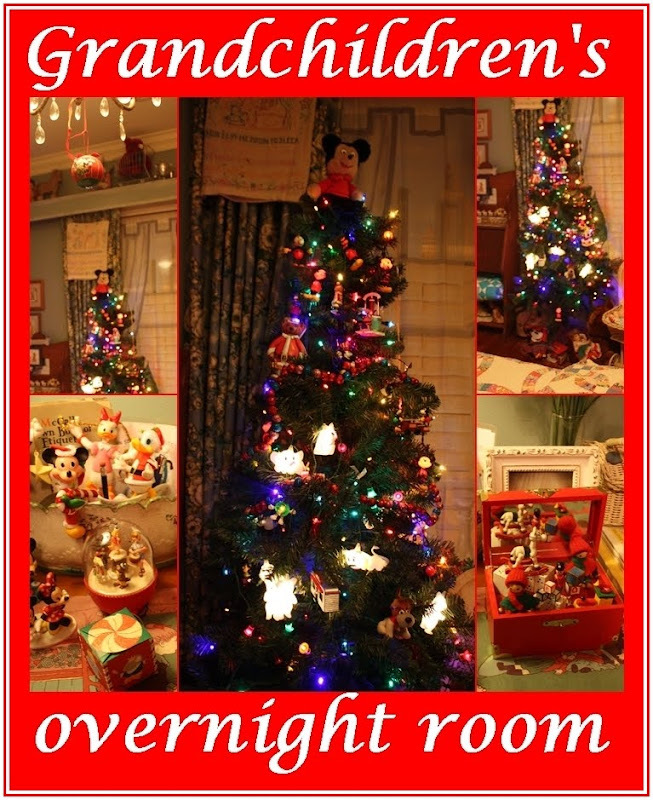 I love it that you call the grandkids room the "Grandchildren's overnight room" I have one of those too! Its all so beautiful and festive!